Ever look at your dies and wish they could be a stamp? Well, we are going to turn that crafty dream into a reality with Maxine’s tutorial! Today, she is going to show you how to turn the adorable and BRAND NEW Dovecraft Unicorn die into a foam stamp to use for gift wrap, clothes and card projects! 1. Add double sided tape to the back of a piece of Dovecraft foam. 2. Turn the foam over and die cut the Dovecraft Unicorn die 3 times. 3. Adhere a die cut unicorn to your thick card and layer the others on top. TIP – Make sure you line the unicorns up as you adhere them on top of each other. 4. Cut around the card, close to the unicorn die cuts, to avoid getting ink onto it. 5. 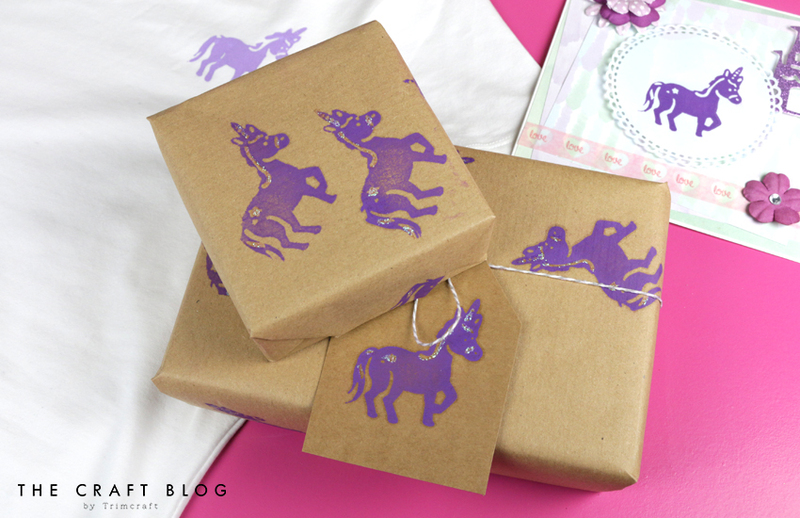 Apply your chosen Dovecraft ink to the unicorn and stamp onto a sheet of brown paper repeatedly. 6. Allow the ink to dry before adding Dovecraft glitter glue to the unicorns, allow to dry. 7. Wrap your gift and make a matching gift tag to finish it off. You could also upcycle a plain t-shirt by stamping this unicorn icon on to it! This is the best way of creating an item of clothing you know no’one else will have. Or you could create a gorgeous topper on your mystical make, the ink really brings out the detail on this die cut stamp design! How cool is this idea? We are definitely keen on turning our favourite die cuts into handy stamps! We’d love to see your makes using this technique so don’t forget to #trimcraft when sharing your makes on social media and to upload your projects to the Inspiration area.